Please revise your manuscript carefully according to the comments of the reviewers. Prepare your manuscript using a standard IEEE conference template. Template:https://www.ieee.org/conferences/publishing/templates.html​. Please double-check the paper size in your page setup to make sure you are using the letter-size paper layout (8.5 inch X 11 inch). The paper should not contain page numbers or any special headers or footers. The maximum length of a paper is 10 pages (no extra page charges). From the final manuscript formatted, authors must generate the electronic FINAL version in PDF format. 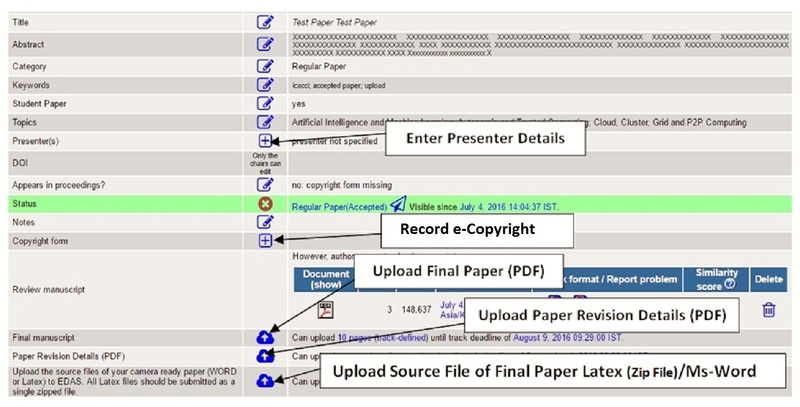 Regardless of its initial format, the file containing the final version of the paper must be transformed in the PDF format using the IEEE PDF express web tool. PDF files generated by means of other tools are not acceptable. Go to IEEE PDF eXpress Website. ( www.pdf-express.org​). Click on the link "New Users - Click Here" and fill in your information. Use IEEE PDF eXpress to convert your source file into IEEE Xplore-compatible PDF(s). The site contains extensive instructions, resources, helpful hints, and access to technical support. Check that title and abstract in EDAS match your camera-ready paper exactly. Please use Title Case for the paper title, i.e. capitalizing all main words. Compare all author names in EDAS with the author list in your paper. They MUST BE identical and in the same order. This is very important because we will be using the information provided in EDAS to generate the final conference program and the table of contents for Proceedings. Please ensure that the abstract and title should be readable stand-alone and not contain any references or unexplained acronyms. You are allowed to modify abstract and author list yourself. You cannot modify the title for the paper, please send a mail to coconet.conference@gmail.com if that is necessary and give a valid reason. Upload the source files of your camera-ready paper (WORD or Latex) on EDAS. All Latex files should be submitted as a single zipped file. Adding the Copyright Strip to Your Paper: Do not add Copyright strip to your paper. The conference will add the copyright strip on the bottom of the first page of your paper. Upload a PDF file which contains the list of revisions you have made on your final paper (answers to reviewers' queries). Attendees visiting Kazakhstan should be particularly aware and careful about Visa requirements, and should plan travel well in advance. Many nationalities would NOT require an invitation letter to attend CoCoNet'18. If you need an invitation letter, please send an email at coconet.conference@gmail.com with CC to ieee@nu.edu.kz​ in which you indicate your: Paper details, full name, full address, passport number and nationality. Please note that it may take several days for a visa memo to be sent out after it is requested. Please plan accordingly. There are several accommodation hotels in Astana, Kazakhstan. A list of suggested hotels has been posted at http://coconet-conference.org/2018/?q=node/21. If you'd like to stay at one of these nearby hotels please make your reservation as early as possible.